Heavy Seas Beer is the first to install higher-speed upgrade of CB50 craft line. STOW, Ohio—More and more, canning is becoming the way craft breweries are getting their beer in the hands of customers. When it comes to canning technology, Pneumatic Scale Angelus (PSA)—one of the companies represented in Barry-Wehmiller Packaging Systems—has been a world leader for 100-plus years, with more than 16,000 installations in 132 countries. Last year at the Brewers Association Craft Brewers Conference and BrewExpo America, PSA debuted its CB50 canning line filler-seamer combo. Breweries such as New Realm Brewing Company, Crooked Stave Artisan Beer Project, Market Garden Brewery and Port Orleans Brewing Co., to name a few, have already installed the CB50 and are producing great canned beer for distribution and onsite sales. Due to demand for a higher-speed version of the CB50, at this year’s Craft Brewers Conference, PSA is introducing the CB100, which is capable of a variable speed range of 30 to 100 cans per minute. 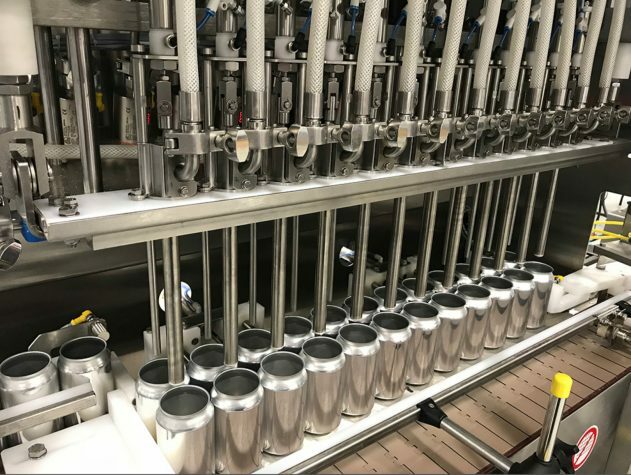 “If you’re looking to upgrade the technology and speed from your introductory canning line, or if you’re a larger brewery looking to enter into the canning market for the first time, this is the line you need,” says PSA vice-president of sales Adam Brandt. One brewery that has already jumped on the chance to purchase a CB100 is Baltimore’s Heavy Seas Beer. “Heavy Seas Beer is experiencing rapid growth for Loose Cannon and other Cannon Crew brands in cans, and we needed a solution that would provide greater speed and high quality,” explains Heavy Seas Beer chief executive officer Dan Kopman. The CB100 has many of the same features as the CB50, but for a high-speed canning line. is designed with quick-change adjustments for easy changeovers for various can heights and body diameters. PSA—along with other Barry-Wehmiller Packaging Systems companies Accraply and BW Integrated Systems—will be in booth #1344 at this year’s Craft Brewers Conference and BrewExpo America, held April 30 to May 3, 2018, in Nashville, Tennessee. The CB50 canning line will be on display. A Barry-Wehmiller Packaging Systems company, Pneumatic Scale Angelus maintains a major market position in the supply of wet and dry fillers, cappers, can seamers, labelers, centrifuges and change parts for the pharmaceutical, personal care, food, beverage, canning and household products industries worldwide. Its custom-engineered product lines include Hema, Mateer and Pneumatic Scale fillers; Consolidated, Pneumatic Scale and TC cappers; Angelus and Closetech seamers; Burt and MTS labelers; Carr and Centritech centrifuges; onTrack orienters and wet-case detectors; and Zepf change parts and storage solutions. For more, go to www.psangelus.com. Barry-Wehmiller is a diversified global supplier of engineering consulting and manufacturing technology for the packaging, corrugating, sheeting and paper-converting industries. By blending people-centric leadership with disciplined operational strategies and purpose-driven growth, Barry-Wehmiller has become a US$3-billion organization with nearly 12,000 team members united by a common belief: to use the power of business to build a better world. Chief executive officer Bob Chapman shares the story of the company’s transformation in his book, Everybody Matters: The Extraordinary Power of Caring for Your People Like Family. To learn more about the ever-growing company, go to https://barrywehmiller.com/.